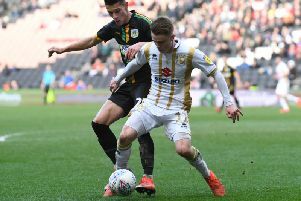 Stuart Moore saved Alex Woodyard's sudden death penalty as Sam Nombe converted the winner in a thrilling Checkatrade Trophy encounter between MK Dons and Peterborough at Stadium MK. The much-maligned competition drew a crowd of fewer than 2,500, but those in attendance saw a belter, with Dons scoring three in the first half, while Posh mounted an incredible comeback in the second to send it to spot kicks. Chuks Aneke needed just six minutes of his return to find the net, also scoring in first half stoppage time either side of Rhys Healey's header to appear to wrap the game up. But a rejuvenated Peterborough side emerged for the second half, with George Cooper scoring just after the restart. Heading into the final five minutes, Dons' two goal advantage evaporated when Jamie Walker and then Matt Godden scored for the visitors, to send it to spot kicks. And with all 10 penalties going in, Moore's save to deny Woodyard allowed Nombe to fire home the winner, picking up two points for Paul Tisdale's side. Paul Tisdale rested most of his first team for the Checkatrade Trophy, but the big inclusion was Chuks Aneke, playing for the first time under the new manager. Stuart Moore was handed his first start too, along with Rhys Healey and Finn Tapp. Brandon Thomas-Asante was also named on the bench for the first time after overcoming an ankle injury picked up in pre-season. With all eyes on Aneke, he did not disappoint as it took him just six minutes to find the net on his return. Having already forced Conor O'Malley into an early save, Aneke headed home Ryan Watson's deep cross to give the home side the lead. Dons started the game brightly and controlled things in the early exchanges. Aneke had a chance to double the lead but put over the bar, while Rhys Healey's low effort was well saved by O'Malley. Making his first appearance in goal for Dons, Stuart Moore made a decent first impression in the opening half hour, twice denying Posh summer signing Ivan Toney – the second a fine block when the striker was clean through on goal. Healey too was making his first start for Dons at Stadium MK, and after an earlier sighter, got on the end of Watson's free kick to head his side 2-0 up 12 minutes before the interval. Posh nearly got back into it five minutes later when Louis Reed fired low through a crowd of players and beat Moore's dive but not the upright as it thumped the post. Isaac Buckley-Ricketts too missed a sitter just before the break, firing over when it looked easier to score. But Aneke would punish them again, finding the bottom corner from the edge of the box in first half stoppage time to send Dons in 3-0 to the good. A new Peterborough emerged for the second half though, and they pulled one back 10 minute in – George Cooper scoring a wonderful free kick from 20 yards to beat Moore. The leaders of League 1 were clearly fired up and weren't far away from halving the arrears 10 minutes later when half time substitute Jamie Walker thumped the base of the post from range, but saw his strike fly across the face of goal before being hoisted to safety by the Dons defence. Aneke though had eyes for a hat-trick and should have had it when a brilliant passing move, aided by David Kasumu, saw him one-on-one with O'Malley. But the front man's deft flick over the keeper fell just wide of the mark – and it would be his last action, replaced by Sam Nombe to a standing ovation. The game looked to be coasting to the finish, but Jamie Walker made it a bit more meaningful when he struck with three minutes to go, and Matt Godden then completed the unlikely comeback in stoppage time, firing home at the far post. The game was settled with penalty kicks, and with all 10 penalties converted in the shoot-out, Alex Woodyard's first kick in sudden death was denied by Moore, allowing Sam Nombe to net the winner.